Few vehicles boast an image as crystal clear as the 2018 Subaru Outback—a wagon version of the automaker’s Legacy sedan that went to finishing school at Outward Bound. This year, a new competitor from a most unlikely source is eager to nab a few would-be Outback buyers. 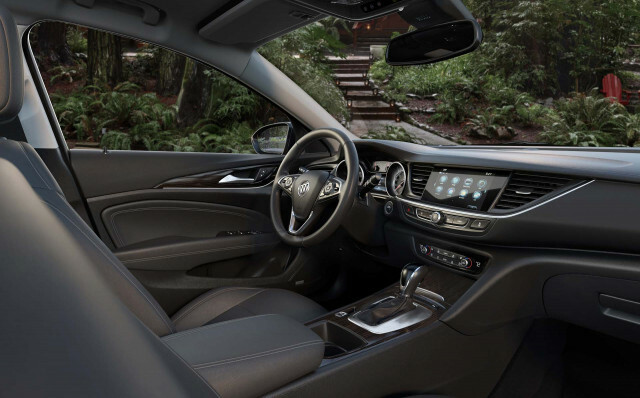 Enter the 2018 Buick Regal TourX, a German-built, German-designed wagon on short stilts that brings a lot to the party. 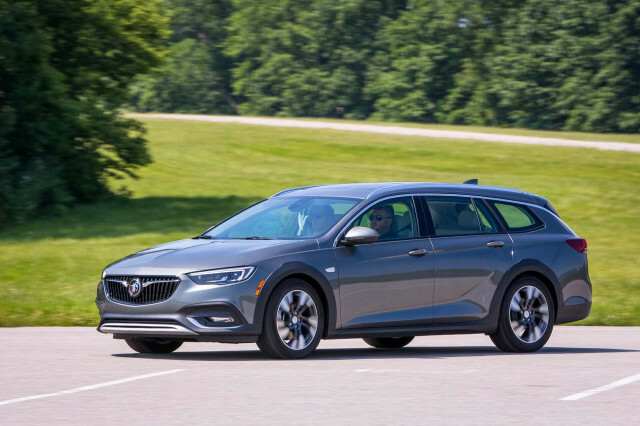 The Regal TourX is part of Buick’s three-prong mid-size car strategy and it joins the hatchback Regal Sportback and Regal Sportback GS models. There’s no Regal sedan, and that’s just all right with the folks at Buick. Overall, we favor the Outback at 7.8 out of 10 points compared to the Regal lineup’s 7.0 out of 10, but there are plenty of reasons to consider either of these rugged crossover alternatives. The Outback range starts at about $27,000 and works its way to nearly $40,000. Base models come fitted with a 2.5-liter flat-4 engine rated at 175 horsepower and 174 pound-feet of torque channeled to all four wheels via a continuously variable transmission. A 3.6-liter flat-6 rated at 256 hp is optional and is worthwhile outside of the flatlands. The Regal TourX comes with just one engine—but it’s a nice one, a 2.0-liter turbo-4 that puts out 250 hp and 295 lb-ft of torque sent to all four corners via an 8-speed automatic. Three Regal trim levels are offered, ranging from about $31,000 to more than $41,000 with every option box ticked. The Buick’s hefty torque endows it with better passing response than either version of the Outback, but it can be a little slower to build power away from a stoplight. Still, the Regal TourX’s refined engine and fast-shifting automatic easily win here, and it muffles road roar better than the Subaru. When it comes to getting dirty, it’s a different story. The Regal TourX sits just half an inch higher than the standard Regal and rides on tires only slightly taller than stock. It comes standard with a fast-reacting all-wheel-drive system, but the limited ground clearance and lack of an off-road mode for its traction control mean it’s little more capable than an average sedan. 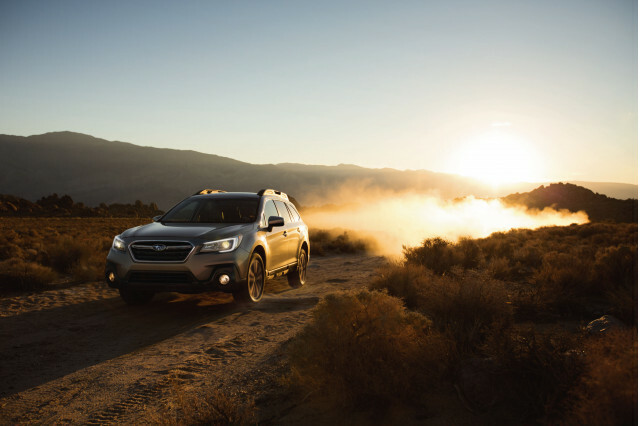 Subaru fits the Outback with a hill-descent control and an X-Mode switch that tweaks the traction control system for mucky terrain. With 8.7 inches of ground clearance, the Outback has no problem reaching most campsites. We think the Subaru’s chunkier looks suit its personality well, but there’s no denying that the Buick is the shapelier of the two. Its roof is lower, with a delicate matte silver strip that dives into its tailgate. Its fender flares are unpainted in faux-rugged style, but the Buick rides much lower to the ground than the on-stilts Outback. Four-cylinder Outbacks are miserly—25 mpg city, 28 highway, 32 combined. Outbacks with the 6-cylinder are a lot thirstier at 20/27/22 mpg. The Buick's turbo-4 splits the difference at 21/29/24 mpg, but it requires pricier premium fuel where the Subarus can run on regular. Additionally, the Buick's small 14.3-gallon fuel tank isn't as adventure-ready as the Outback's 18.5-gallon unit. Inside, the two tall wagons deliver similar numbers on paper but a different degree of utility in practice. Up front, they share dashboard and seat designs with their less-rugged brethren. The Outback’s symmetrical dash is functional, if light on style, while the Regal’s low panel is a little swoopier and more interesting at first glance. Rear seat passengers have a little more stretch-out room and better ingress and egress in the Subaru. 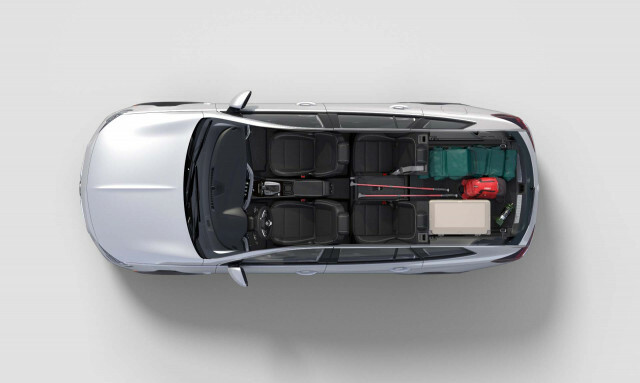 Both top out at about 74 cubic feet of maximum cargo space and about 33 cubes with the rear seats upright. 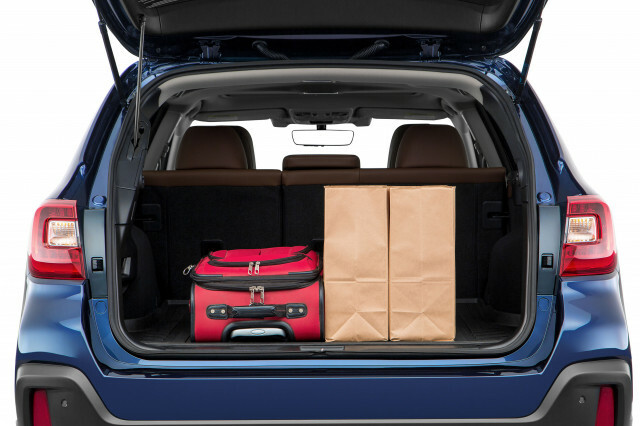 The Regal TourX’s cargo hold is longer and not as deep as the Outback’s, but both pack gear in a similar fashion. Up top, most versions of the Outback have chunky roof rails with deployable crossbars ready for aftermarket kayak, bike, and ski holders. The Buick’s roof rack is a slim, lower design that makes the car more aerodynamic but requires adventure-ready owners to pop for crossbars in addition to whatever gear racks they also need. Both cars have infotainment systems that are easy to sort through. 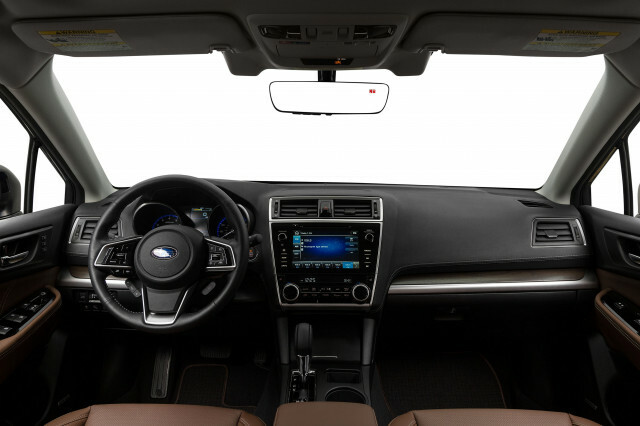 Base Outbacks use a 6.5-inch touchscreen for infotainment, while Premium and higher trim levels—the ones far more common on dealer lots—feature an 8.0-inch display that can be upgraded with navigation. Buick fits base and Preferred trims of the Regal TourX with a 7.0-inch screen, reserving an 8.0-incher for the range-topping (and rather oddly named) TourX Essence. On both vehicles, Apple CarPlay and Android Auto are standard equipment. Only the Buick offers the convenience and security of parent company GM’s OnStar system, although it requires a monthly subscription fee after an initial trial period. The Outback lineup spans a wider range than the TourX does, and it makes some important safety tech available at a much more reasonable price point. 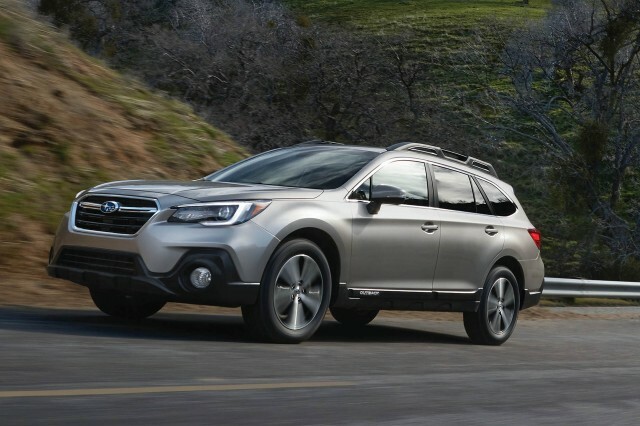 Base Outbacks start about $27,000, while the more popular Premium trim level with Subaru’s optional EyeSight safety package—automatic emergency braking, adaptive cruise control, and blind-spot monitors—is reasonably priced at about $31,000. That’s roughly where the Regal TourX starts, albeit with a more powerful engine. However, most buyers will bypass the base model. It’s rather sparsely equipped without a power driver’s seat, heated front seats, or a leather-wrapped steering wheel, and it’s available in just three exterior hues. It’s a head-scratcher to us. Instead, the Regal TourX Preferred runs $34,500 and addresses those issues. 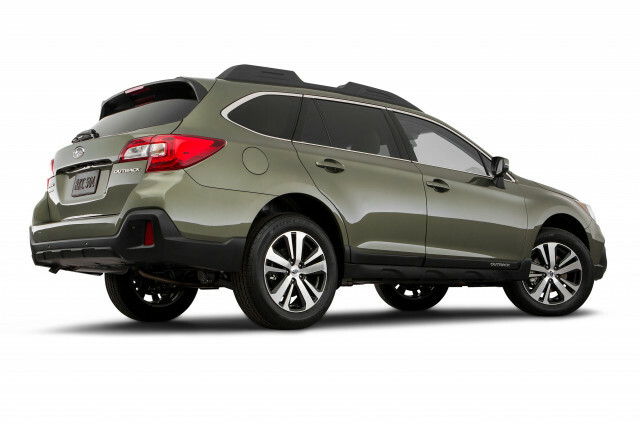 The apples-to-apples comparison is between the TourX Essence—about $37,000—and the Outback 3.6R Limited—about $36,300, albeit with a power moonroof and premium audio, and navigation. Equipped the same, the Regal TourX is $3,500 pricier. One final caveat: Buick restricts desirable advanced safety gear like automatic emergency braking to the TourX Essence, where it requires two option packages that add almost $3,000 to the bottom line. That’s a hard upcharge for us to swallow, and it’s yet another nod in the Subaru’s favor. In the end, the Regal TourX surprises us with its comfortable ride and strong engine, but it comes up short in enough ways that the Outback remains our adventure wagon of choice. 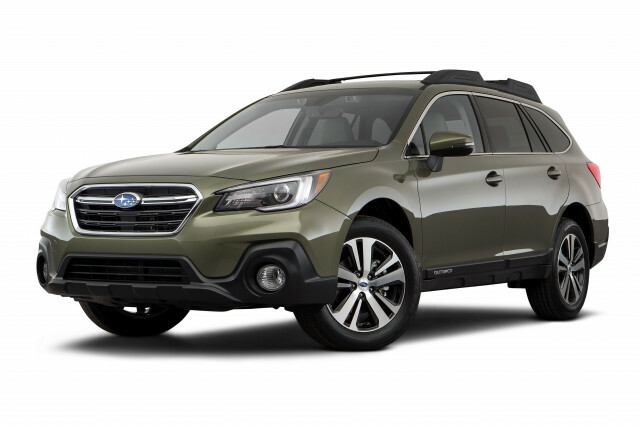 We have sent your request for price quotes on the 2018 Subaru Outback and 2018 Buick Regal to the dealers you requested. They should be in touch shortly. Your request for a fast, free price quote on a 2018 Subaru Outback and 2018 Buick Regal is in process. The CarsDirect Dealer(s) listed below will contact you shortly to discuss your request and to provide a quote.